Last year the London-based design consultancy Johnson Banks was asked to interpret the length of time it takes for Glenfiddich single malt whisky to mature in barrels. They decided to focus on the ‘jobs’ that each part of the barrel have to do over the different lengths of time the five different whiskies mature. My favourite barrel is the one below becuase, at first, when IÂ did not realise it was about whisky, it struck romance in my heart. Now that I know it is about whisky, the sense of tradition and charisma make it even more romantic. 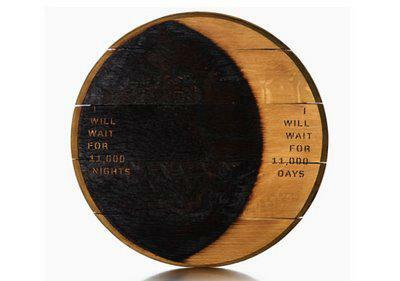 1978 - The whisky that takes longest to mature, the 30 years, is represented by the moon and the sun etched and charred onto the lid of a barrel. To see the other barrels from this exciting project click here. This entry was posted in Blog and tagged barrles, Exhbition, Glenfiddich, Johnson Banks, romance, whisky.